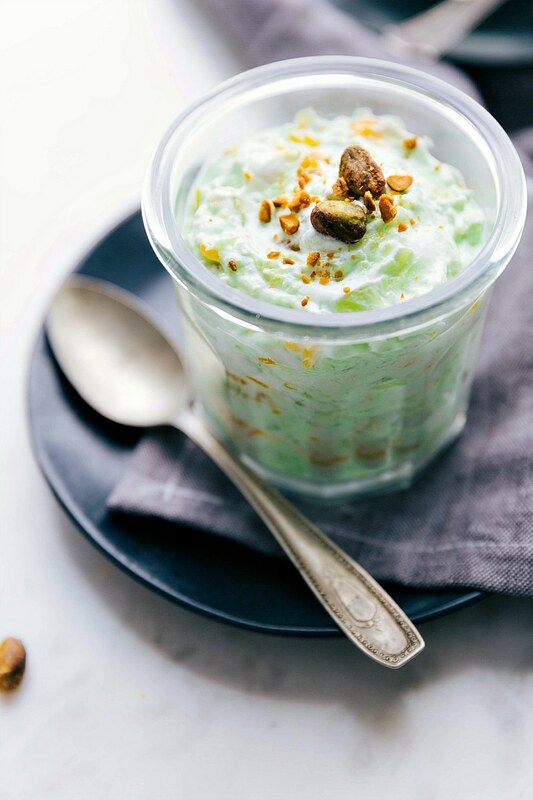 The famous Watergate Salad: a retro side or dessert “salad” with canned fruits, pistachio pudding mix, whipped cream, and crushed pistachios. This salad was a staple in my home growing up! My Aunt made this (or frog eye salad) for every family potluck meal or holiday dinner. I don’t think we ever had a Thanksgiving or Christmas dinner without her famous watergate salad recipe. Why do they call it a Watergate salad? Seems like a strange name, no? Well, it turns out there are a few different theories out there on where the name came from. A lot of sources agree that a chef in the Watergate Hotel (in the Washington, D.C. area) created this dish and served it there as a specialty item. The dish became synonymous with where it was served, hence the Watergate salad. An alternate theory is that in 1975 when Kraft Foods released their pistachio pudding mix, they promoted it alongside this very recipe. It’s said that an editor in the Chicago newspaper reprinted the recipe and named it “Watergate Salad” to go along with the political scandal of the time. Whatever you call it or believe this salad’s history to be, it is easy to make and so delicious! Read on about how to make this salad, what ingredients are in it, and some different variations you can try. How do you make Watergate salad? 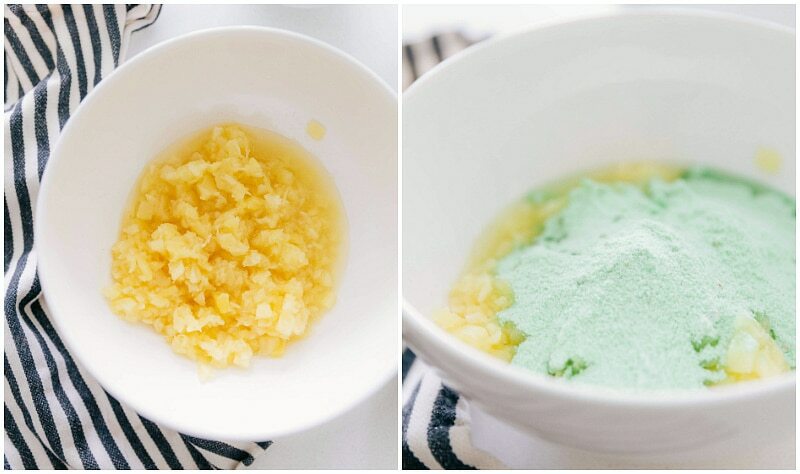 Start by stirring together the crushed pineapple with pistachio pudding mix. Next you’ll add in the marshmallows, mandarin oranges, and pistachios. Finish by folding in the whipped topping. Chill the salad for about 45 minutes to an hour before serving. What are the ingredients in a Watergate salad? While watergate salad recipes vary quite a bit, I think over the years I’ve tried just about every combination! I’ve found less is more and the “perfect” watergate salad combines crushed pineapple, pistachio pudding, mandarin oranges, mini marshmallows, pistachios, and whipped topping. Making a watergate salad with mandarin oranges isn’t completely traditional, but we’d never make it without them! 🙂 We’ve also tried this watergate salad with cottage cheese (a common ingredient in a lot of retro salad recipes) and it was not a huge hit. If you do opt to add in cottage cheese, I’d recommend leaving out the marshmallows and testing a little bit with the cottage cheese first. Try this watergate salad with cherries by adding 1/4 cup chopped maraschino cherries. Colored mini marshmallows instead of white mini marshmallows add an additional fruity flavor and fun color. Additional fruit: try adding in an extra can of drained mandarin oranges, a can of drained fruit cocktail, or a sliced banana (add right before serving). 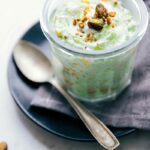 If you aren’t a fan of pistachio, try making a watergate salad with lime jello! This recipe is slightly different than your typical watergate salad recipe but it uses a lot of the same ingredients. 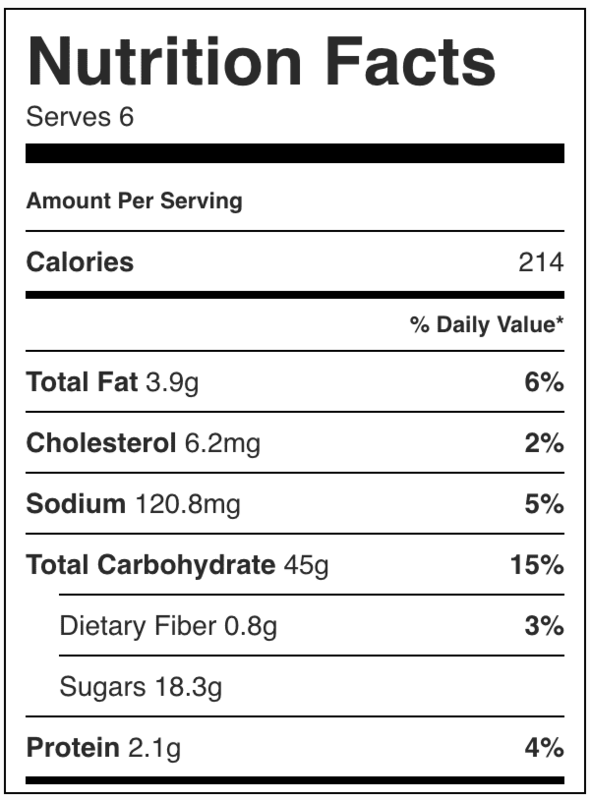 For a lower calorie version, try using lite whipped topping. 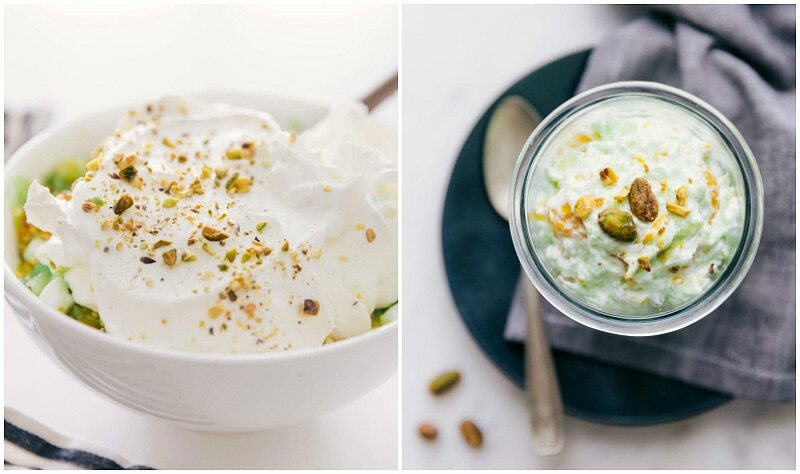 Creamy pistachio-flavored Watergate Salad filled with canned fruits, pistachio pudding mix, whipped cream, and crushed pistachios. This side dish salad or dessert salad is also referred to as "pistachio fluff," "green fluff," or "green goddess"
Add the undrained pineapple and pudding mix in a large bowl. Stir until smooth. 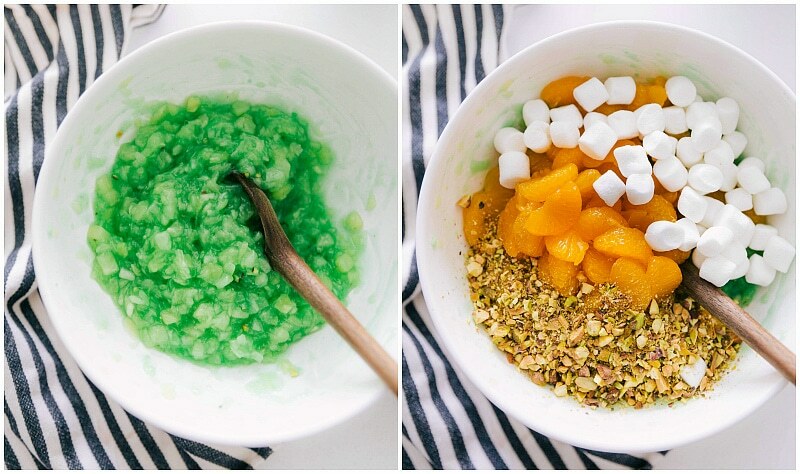 Add in the well drained mandarin oranges, mini marshmallows, and coarsely chopped pistachios. (IF desired, add in fruit cocktail here.) Gently fold together until combined. Using a spatula, gently fold in the thawed frozen whipped topping until all the ingredients are well covered. Cover and refrigerate for 45 minutes to an hour. 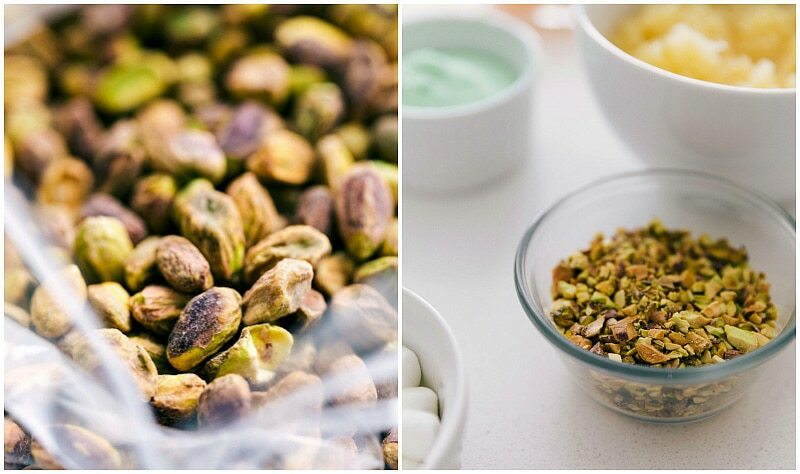 Serve chilled with a sprinkle of shredded coconut or additional crushed pistachios if desired.